After years of planning it's wonderful to see this great Austrian city hosting such a prestige brass band event. Now that the air space is open again and flights are running it seems everyone will be able to make it as scheduled. With a sell-out venue and great music-making in prospect, it's a mouthwatering scenario for brass band enthusiasts. For the growing brass band world in Austria it's incredible to have Europe's finest bands on its doorstep. I will be performing with the European Youth Brass Band under the direction of Karl Geroldinger. This band draws its players from all over Europe. The concert in which I'll be performing with them is on Wednesday 28th , at the Kirchdorf Music School, at the opening ceremony on friday and the Farewell Concert in the Brucknerhaus on sunday morning, and the main piece will be Thomas Dos' ‘Sir Eu', that was composed for SoundINNBrass and myself, and is on the CD MeadINNBrass. Rumour has it we'll also be featuring Zeibekikos (Wilby) and Serenade (Drigo). Going on at the same time in Linz is the 5th European Solo Competition which has attracted some of the very best young soloists around Europe. The talent here is quite incredible, and it's especially good to see so many excellent euphonium and baritone players on this list!!! I will be one of the judges for the final on Thursday evening. On Friday morning is the opening ceremony for the competition, and I am delighted to also be involved with SoundINN Brass in this imaginative and culturally important curtain-raising event. Then the battle of the bands can commence on Friday afternoon and continues on Saturday. It should be an extremely high level competition with some great new works in the own choice section. Also of real interest will be with how the bands cope with Thomas Dos' set test piece, Spriti. This is without doubt the hardest set test piece I have ever seen at the European, and perhaps one of the hardest test pieces ever. I think it's probably too difficult, and will stretch the bands rather mercilessly, but as always I'm sure the bands will rise to the challenge !! 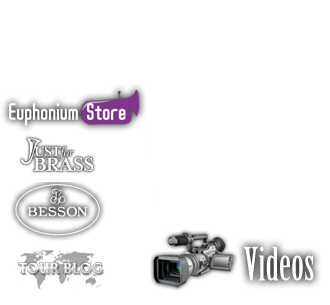 It's also with great pride that I acknowledge Besson as the main sponsors, who once again show a commitment to the brass music world with their generous support. Good luck to all competitors, bands, soloists, and adjudicators !